New York, NY : Balzer + Bray, an imprint of HarperCollinsPublishers, 2018. 286 pages ; 22 cm. Nathan Bird doesn't believe in happy endings. Although he's the ultimate film buff and an aspiring screenwriter, Nate's seen the demise of too many relationships to believe that happy endings exist in real life. Playing it safe to avoid a broken heart has been his MO ever since his father died and left his mom to unravel--but this strategy is not without fault. His best-friend-turned-girlfriend-turned-best-friend-again, Florence, is set on making sure Nate finds someone else. And in a twist that is rom-com-worthy, someone does come along: Oliver James Hernández, his childhood best friend. 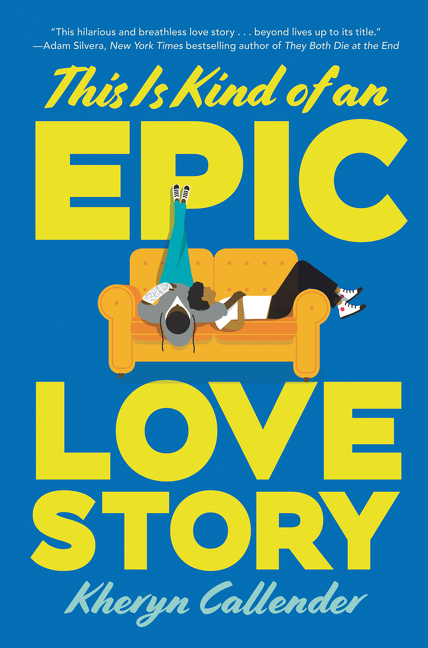 Budding screenwriter Nate, sixteen, finds his conviction that happy endings do not happen in real life sorely tested when his childhood best friend and crush, Oliver James Hernandez, moves back to town. Film buff and aspiring screenwriter Nathan Bird doesn't believe in happy endings since his father died and his mom began to unravel. His best-friend-turned-girlfriend-turned-best-friend-again, Florence, is set on making sure Nate finds someone else. And that someone does come along: Oliver James Hern�ndez, his childhood best friend. But can Nate find the courage to pursue his own happily ever after? -- adapted from jacket. Callender, K. (2018). This is kind of an epic love story. First edition. New York, NY: Balzer + Bray, an imprint of HarperCollinsPublishers. Callender, Kheryn. 2018. This Is Kind of an Epic Love Story. New York, NY: Balzer + Bray, an imprint of HarperCollinsPublishers. Callender, Kheryn, This Is Kind of an Epic Love Story. New York, NY: Balzer + Bray, an imprint of HarperCollinsPublishers, 2018. Callender, Kheryn. This Is Kind of an Epic Love Story. First edition. New York, NY: Balzer + Bray, an imprint of HarperCollinsPublishers, 2018. Print. |a Callender, Kheryn, |0 http://id.loc.gov/authorities/names/no2017122565 |e author. |a This is kind of an epic love story / |c Kheryn Callender. |a New York, NY : |b Balzer + Bray, an imprint of HarperCollinsPublishers, |c 2018. |a 286 pages ; |c 22 cm. |a Budding screenwriter Nate, sixteen, finds his conviction that happy endings do not happen in real life sorely tested when his childhood best friend and crush, Oliver James Hernandez, moves back to town. |a Film buff and aspiring screenwriter Nathan Bird doesn't believe in happy endings since his father died and his mom began to unravel. His best-friend-turned-girlfriend-turned-best-friend-again, Florence, is set on making sure Nate finds someone else. And that someone does come along: Oliver James Hern�ndez, his childhood best friend. But can Nate find the courage to pursue his own happily ever after? -- adapted from jacket. |a Best friends |v Juvenile fiction. |0 http://id.loc.gov/authorities/subjects/sh2009116960. |a Bisexuality |0 http://id.loc.gov/authorities/subjects/sh85014412 |v Juvenile fiction. |0 http://id.loc.gov/authorities/subjects/sh99001687. |a Deaf |0 http://id.loc.gov/authorities/subjects/sh85036047 |v Juvenile fiction. |0 http://id.loc.gov/authorities/subjects/sh99001687. |a High schools |v Juvenile fiction. |0 http://id.loc.gov/authorities/subjects/sh2008105601. |a Mothers and sons |0 http://id.loc.gov/authorities/subjects/sh85087539 |v Juvenile fiction. |0 http://id.loc.gov/authorities/subjects/sh99001687. |a People with disabilities |v Juvenile fiction. |0 http://id.loc.gov/authorities/subjects/sh2010105456. |a Single-parent families |v Juvenile fiction. |0 http://id.loc.gov/authorities/subjects/sh2010112513. |a JUVENILE FICTION |x Family |x General. |2 bisacsh. |a Best friends. |2 fast |0 (OCoLC)fst00830870. |a Bisexuality. |2 fast |0 (OCoLC)fst00833344. |a Deaf. |2 fast |0 (OCoLC)fst00888436. |a Friendship. |2 fast |0 (OCoLC)fst00935174. |a High schools. |2 fast |0 (OCoLC)fst00956288. |a Mothers and sons. |2 fast |0 (OCoLC)fst01027007. |a People with disabilities. |2 fast |0 (OCoLC)fst01057245. |a Schools. |2 fast |0 (OCoLC)fst01107958. |a Single-parent families. |2 fast |0 (OCoLC)fst01119481. |a Young adult works. |2 fast |0 (OCoLC)fst01726790.